Dissolve gelatin in hot water. Add cold water. Chill until slightly thickened. Set aside one-half cup for topping. With remaining gelatin fill parfait glasses about two-thirds full. Tilt glasses in refrigerator by catching base between bars of refrigerator rack and leaning tops of glasses against wall. Chill until firm. Whip cream and fold into the one-half cup slightly thickened gelatin. Pile lightly in glasses. 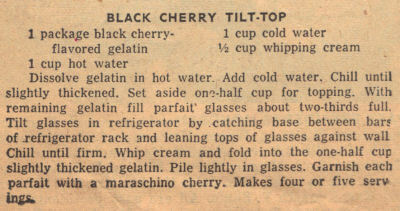 Garnish each parfait with a maraschino cherry. Makes four or five servings.